Client/Server's debut release consists of a husband and wife team. 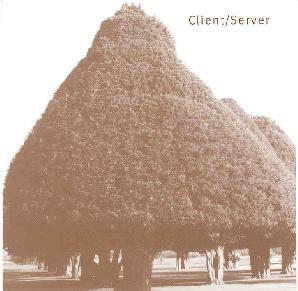 A clever name considering "client/ server" is the technical term for the computer relationship of retrieving and supplying data in the current internet model. Droning electronic repetitions and delicate guitar melodies comprise the musical tools used on this CD. This music is perfect for late nights when you don't want to go to sleep but don't have the energy to actually do anything else. It relaxes with its simplicity and repetitive nature. "Mighty Sunfish" features a beautiful, resonant acoustic guitar melody accompanied by an electronic pulse that resembles an electrified sitar drone. This, along with "Space Godzilla," is one of the best songs on the CD. The aforementioned song sticks to the same formula of a soft electronic drone and a slow, repetitive, and celestial guitar melody. Other songs like "Ceecilweed" exhibit greater complexity in their electronic arrangements. I thought the music in this song was a very well done collage of electronic drones, but it was ruined by the use of voice samples. The magic of the CD is broken up by a rather obtrusive voice touting the glories of online shopping. The next track suffers the same fate, but this time from a sampled news reporter. I would have much preferred the dream-like ambience of pure music that the band had used up to that point. "Porco Rosso part one" is the longest song (16 minutes). It would be much better without the muffled voice samples and high-pitched buzzing that makes its way into the mix. Finally, the oddly named "Don't Like Noodles? Try My Fist!" relies solely on the guitar. The first chord of the repetition is barely audible while the remaining chords sound like someone's trying to break a string. This is due mainly to bad recording. Overall I think this is a promising effort despite some of the rookie mistakes. Most of the songs here are worth hearing and a few of them are excellent. I look forward to their next release. Contact via snail mail c/o Three Lonely Kaiju Records; 16A Gerry St; Cambridge, MA 02138.